This is probably going to be the largest update to date. It’s also one self-contained chapter of the story, because I feel as though the events in it are important enough to go through the entire section in one go. “Now, where are they? Palom! 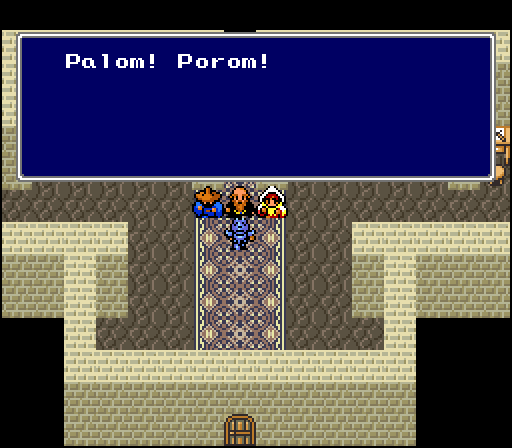 Porom!” A young girl, not much older than Rydia suddenly appeared on my right. “You called for us, elder?” The elder nodded to the girl. “But where is your brother, Polom?” To my left, a young boy, the same age as the girl appeared. “Here I am! So this is the guy who wrecked up our village and now wants our help!” I looked to the elder, confused. “These two children! ?” “Yes, those two. They may be young, but do not let their appearances deceive you.” The boy spoke again. “Be glad that the Mysidian genius Palom is with you! You should be thanking me!” The little girl faced me, and curtsied. “Nice to meet you.” “Cecil.” “Nice to meet you, Cecil. I’m Porom.” She looked to the boy. “Palom! You must greet him!” The boy turned to me. “Hey dude.” This is going to be a nightmare. The elder spoke. 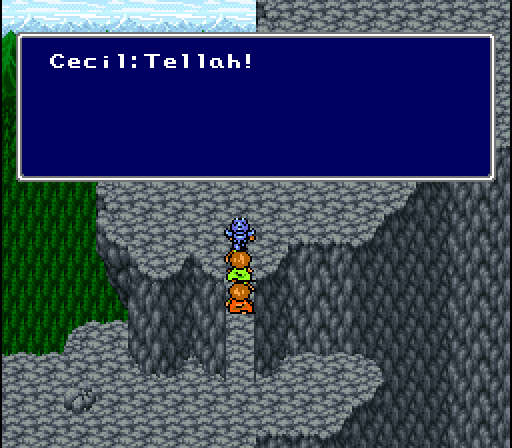 “Now, Cecil, it is time for you to face Mt. Ordeals. Palom and Porom will help you to the best of their abilities.” We left the chamber, stocking up before we left town. It was a long walk to Mt. Ordeals. A few days later we had made it to the base of the mountain; a wall of fire barring our progress. Porom spoke to her brother. “This is your area, brother!” “I know! You don’t gotta tell me, sis!” He turned to the wall of fire, and begun chanting. This reminded me of Rydia, on Mt. Hobs. “Ice!” A blast of cold air erased the flames. “Easy as pie! Piece of cake! Nothing to the Mysidian genius Palo–” WHACK! The girl smacked him “Palom! Don’t you remember, the elder told us not to give in to arrogance!” This was going to be a long climb. “You overcame the darkness within and became a Paladin, Cecil!” I smiled. This felt good. Different. “Cecil, to be honest with you, I sent Palom and Porom with you to spy on you. To see if your words matched what was in your heart. It turns out that there was no need for that.” I nodded; I understood. “I would have done the same thing, had our roles been reversed. I deserved it, for the atrocities I had committed.” “But you’ve overcome the past and have rightfully become a Paladin and..” His eyes caught my blade. “That sword!? Where did you get that sword! ?” “I received it on Mt. Ordeals.” “May I see it?” I nodded, handing the blade to him. “Incredible! The inscription on this blade is the exact same as the Mysidian Legend!” “Legend? What legend?” The elder cleared his throat. “It goes something like this: One to be born from a dragon, hoisting the light and the darkness arises high in the sky, descending upon the still land. Veiling the moon with a light of eternity, it brings with it another promise to mother earth with a bounty and mercy.” Huh? “The light called me ‘My son’, as well. What was that light?” He handed me back the blade. “I do not know, nor do I know what the legend means. But, I believe you are vital to it, Cecil. As Mysidans, we’re told to pray for this legend to come true. And to believe in the one with the sacred light.” Tellah finally spoke. “We must hurry! 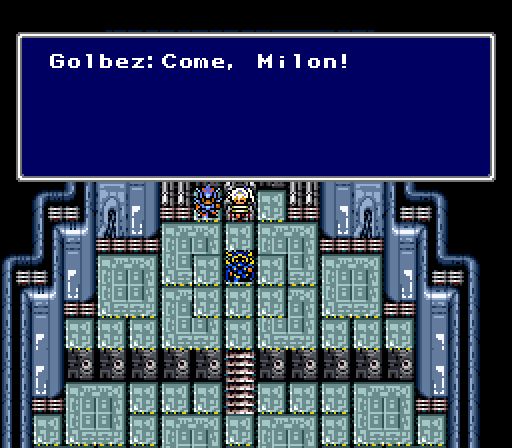 Golbez must be defeated!” The elder looked to Tellah. “It’s been awhile, old man.” We met him on Mt. Ordeals!” Porom chirped. “Yeah! He knows Metro now, dude!” Palom added. The elder was shocked. “What!? Is the world in such a great danger to break the seal upon Metro?” Tellah nodded. “It seems as it is. I will avenge Anna with Metro!” “Tellah, you mean..” “Yes, Golbez took her life. I shall make him pay with the power of Metro. Even though it will cost me my life, I cannot forgive Golbez.” “I thought you’d say something like that, Tellah. Even through all these years, you still refuse to change.” Tellah grinned. “You too. You’re as stubborn as ever.” The elder looked to me. “Cecil has now become a Paladin. Perhaps if you were to join forces.” I spoke. 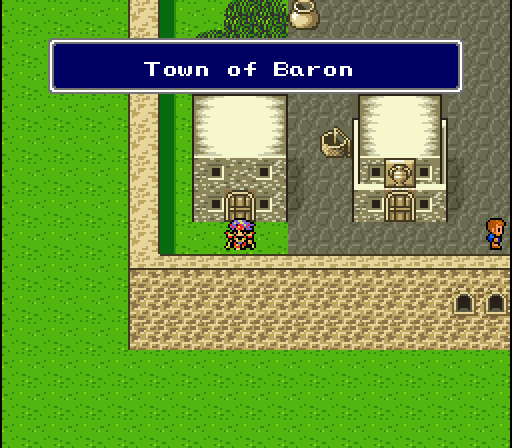 “We must get to Baron and find an airship. 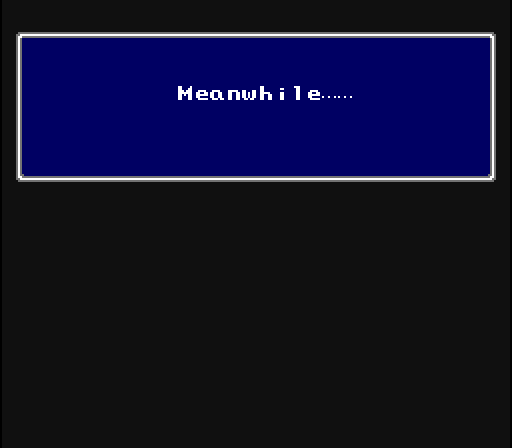 Only then may we fight Golbez on equal terms. As long as he has an airship, he has the advantage.” The elder nodded. “Very well. I shall open Serpent’s Road. It will take you to Baron quickly. I shall confine myself to the Tower of Wishes and pray for you all.” We all headed to the door. The elder spoke once more. “Palom, Porom. You have completed your task.” Palom spoke. “It’s not over, dude! You told us to help him!” Porom spoke. “Please allow us to go with him.” The elder paused, thinking for a moment. “Very well. Mt. Ordeals accepted you, and you returned alive. Perhaps this is your destiny. Cecil, and Tellah. Please look after these two children.” “We shall. By your leave.” We exited the building and quickly made our way to the entrance of Serpent’s Road. Without thinking, I jumped into the portal, I could see the others following me. We arrived in a room that looked identical to the one we had left. Did it work? Home. I was home again. It was time to find a ship, and Cid and go save Rose.. Previous: Chapter 3, Part 3.